Recently, a friend sent me a link to a video called, “An Evening of Eschatology.” (As the video points out, “eschatology” is just a $2.00 word for “last things” or the end of all things). In the video, John Piper moderates a discussion between Jim Hamilton, Sam Storms, and Doug Wilson, each of whom represents one of the main eschatological views: pre-millennial, amillennial, and post-millennial, respectively. Anyone up for two hours of friendly sparring about last things should check it out: http://www.desiringgod.org/resource-library/conference-messages/an-evening-of-eschatology. This post isn’t really about the video except that it got me reading Revelation, and I wanted to share some preliminary thoughts. “When?” is a key question when approaching Revelation, and sincere Christians disagree about how to answer it. Is Revelation already fulfilled and in the past? Can Revelation help us understand the here and now? Are we still awaiting the events of Revelation? Broadly speaking, the major eschatological camps have formed around how to answer the “When?” question. That said, I think there is a more fundamental question: “Who?” Who is Revelation about? The antichrist? The 144,000? Revelation 1:2 says that John testified “to everything he saw—that is, the word of God and the testimony of Jesus Christ.” On its face, this statement seems so basic it is easy to dismiss. But think of it. Everything in John’s vision, no matter how bizarre, testifies of Jesus. Later, Revelation 19:10 tells us, “the spirit of prophecy is the testimony of Jesus.” The answer to the “Who?” question is Jesus Christ. Everything else in the book is peripheral to Him. 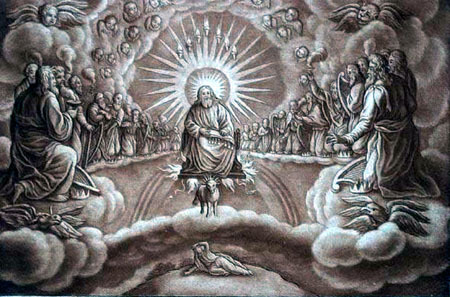 Jesus, we are told, is the One “who is, who was, and who is coming” (Rev. 1:4, 8; 4:8). Suddenly, the “Who?” question has bearing on the “When?” question. “Jesus Christ is the same yesterday and today and forever” (Heb. 13:8). Jesus makes the past, present, or future choice a false trichotomy. Perhaps this is why John is told, “Write…what you have seen, what is now and what will take place later” (Rev. 1:19). He wasn’t writing about the past, present, OR future. He was writing about Jesus Christ, who is past, who is present, who is the future. Revelation isn’t located in one segment of time so much as it spans all of time. How this plays out through the rest of the book I don’t entirely know. But I hope this approach will be revealing! Exceptionally well stated, Teague. A million and one American Christians would benefit by your words. Thank you so much for that high compliment! “The anamnesis is the recalling before God of the saving acts of Christ: “Remembering this saving commandment and all those things which have come to pass for us: the Cross, the Tomb, the Resurrection on the third day, the Ascension into heaven, the Sitting at the right hand, and the second and glorious Coming.”” I don’t know if it jumped out at you on the first reading, but the Second Coming is remembered as something which has *already* come to pass. God, Christ being outside of time, these events, His saving acts are all completed, radiating through time forwards and backwards. Anyway, I guess that was just to say you have support in your thoughts above. Cool, and very humbling, stuff. Thanks! Yes, I think Revelation brings a very eternal (outside of time) perspective. There is a verse, in Revelation 13, I think, that says the Lamb was slain before the creation of the world. I think that also speaks to your comments. Thanks! By the way, Nagemsis, I just realized who this is. My reading backwards ain’t what it used to be, apparently. LOL.